n October of 2015, I parted from Enas Hamra, a fellow from the TechWoman 2015 program and my mentee. She was making her way back home to Gaza, and as we said our good byes, her final words to me were, "You have no idea how difficult my life is." She was right. I had absolutely no idea–until three months later when I would learn the difficult truth. Fast forward to February 16, 2016, as I crossed the final checkpoint from Israel to Jordan and could once again move freely between neighborhoods undivided by walls as high as 25 feet. At this moment, for the first time in my life, I appreciated what I had always taken for granted–my freedom to come and go as I please, to move between neighborhoods unrestricted--without showing identification, enduring tense interrogations, or waiting hours for permission to enter or to leave. I traveled to Jordan as part of the TechWoman delegation program that I wrote about in my post last November. My purpose for joining the delegation, among others, was to reconnect with the TechWomen community for whom I’m a mentor. TechWomen is a program of cultural exchange, and it was my privilege to experience the impact of the TechWomen Fellows in the Middle East where I meet some of the young women entrepreneurs who are doing phenomenal things in the field of STEM (Science Technology Engineering and Math). I was able to witness the various initiatives underway for girls in STEM and meet with the startup community in Jordan. After attending the delegation program, I traveled to Gaza, Palestine, where I joined other TechWomen mentors from the San Francisco Bay Area. While there, we delivered a series of workshops to Gaza Sky Geeks, the only tech accelerator in Gaza. I was thrilled to have this unique opportunity as it gave me a chance to meet with the start-up community in Gaza, and also to reconnect with Enas. The trip to Gaza also gave me the opportunity to follow the same footsteps Enas took when she came to San Francisco last October – but in reverse. I was able to experience for myself how difficult that journey was for Enas. Like Enas, who experienced many “firsts” on her visit to San Francisco, I too experienced many firsts on my visit to Gaza. While one of Enas’ firsts was having to make decisions about her whereabouts completely independent of others, one of mine was having to depend completely on others for permission to move about. Like Enas, I too was forced to step outside of my comfort zone. I had to get comfortable with the unknown, be ok with uncertainty, and learn to be patient. Since I traveled alone from Jordan to Israel by road, I had my first test of patience when I waited for many hours at the Israeli border crossing before I was given clearance to enter. This became a theme of my trip as I continued my journey onwards to Gaza. Gaza is like a “country” of its own; it’s a self-governing Palestinian territory that borders Israel on the east and north and Egypt on the southwest. Entry to and exit from Gaza requires a series of permits, check points, lots of coordination, determination, grit, and commitment. Only a select few are granted permits to enter and exit Gaza. Even with permits, permission is not guaranteed and Gazan residents can wait for hours, even days only to be turned back. he border crossing between Gaza and Israel which is restricted to Palestinian residents except in exceptional humanitarian cases. I didn’t know how to interpret the long wait time as Israeli border officials didn’t provide updates along the way. I felt an uneasiness that I had never felt before when faced with the possibility of being stranded in a place, unable to leave. Like the many desperate people at the border crossing, I found myself sharing their anxiety. Furthermore, travel for all Palestinians is complicated because they are not allowed to travel through the Ben Gurion Airport in Israel which is 56 miles from Gaza. The Israeli government requires all Palestinian card holders to drive across country to Amman, Jordan and enter via the Allenby Bridge border crossing, which connects Israel to Jordan.The 102 miles distance from Gaza to Amman can take anywhere from a day to several days and each point in the journey requires permits and interviews with the Palestinian, Israeli, and Jordanian border control. I experienced this first hand as I made my own journey across the final Allenby Bridge border crossing in Jordan. It took me over nine hours to get across from Gaza to Jordan. s a result of these challenges, many Palestinians miss flights, fail to attend business meetings, experience further delays in receiving urgent medical care, and miss many of the day to day activities that we take for granted. During my trip, I met several individuals who missed international conferences or award ceremonies because they couldn’t receive their permits in time or couldn’t make it past a check point. Despite the adversity, I saw a silver lining of hope through Gaza Sky Geeks. 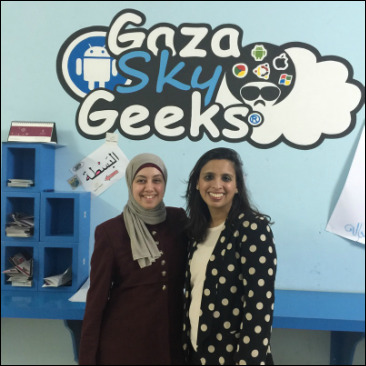 Gaza Sky Geeks has created an oasis where eager entrepreneurs see their ideas to fruition and get the nurturing support to help make their dreams become a reality. When I met the young entrepreneurs at Gaza Sky Geeks, I saw inexhaustible aspirations. I saw hunger in many of the women entrepreneurs’ eyes for collaboration and exchange with entrepreneurs outside of Gaza so that they can build startups that will lead to more economic opportunity for their communities. I saw ambitious and talented women with a deep curiosity for learning and embracing new technology. Most of all, I saw resilient women who despite not being allowed to travel freely outside of Gaza and not having electricity for 8 hours a day, continue to dream and aspire for a better tomorrow. Some of these dreams include running successful businesses, pursuing higher education/job opportunities beyond Gaza, and participating in programs like TechWomen. I admired how Gaza Sky Geeks has created a space that supports young entrepreneurs in pursuit of a better life, from providing them with opportunities to learn business fundamentals, to gain exposure to new ideas and cultures, and to obtain seed grants so that they can own their startups. This could have been a tech accelerator in San Francisco, Silicon Valley, or New York- except for Gaza Sky Geeks, things looked very different on the outside. When I finally passed the last check point from the Allenby Crossing connecting Israel to Jordan on February 16th, 2016, a rush of relief washed over me. I felt like I had just made my way to the surface for air after being underwater. For the first time in my life, I felt gratitude for my freedom. I also felt an overwhelming sadness for the people of Gaza because I was allowed to move freely, while they were not. dedicate this post to Enas Hamra and all of the women in Gaza for their bravery and resilience.